Sun Pharmaceutical Industries’ buyout of Ranbaxy Laboratories creates the biggest generic drug business by sales in India, with combined annual revenue estimated at $4.2 billion. The move is also seen to enhance Sun Pharma’s global presence by providing it access to various new and emerging markets and product portfolios. Besides, with the acquisition of Ranbaxy, Sun will add to its assets a huge manufacturing base, expected to reap benefits for the Mumbai-headquartered company in the long run. However, Sun Pharma will face some challenges in rationalising the field force and other personnel. The company will also have to create a common board, requiring substantial restructuring of the existing top managements in both the companies. Though Sun maintained it was not looking at any “immediate” reduction of field force, it said it might have to “reorganise” to create a global business. The product pipelines of Sun and Ranbaxy are also likely to face slight overlapping. Sun Pharma said it expects the acquisition to be accretive to earnings per share in the first full year. “The quality of business at Ranbaxy is in no way inferior to business at Sun Pharma,” Dilip Shanghvi, managing director of Sun Pharma, said in a conference call with analysts, after announcing the deal. He added the company would initially focus on addressing the issues in achieving compliance to bring back the ailing factories of Ranbaxy to start exporting to the US. Currently, four major factories of Ranbaxy in India – at Paonta Sahib (Himachal Pradesh), Dewas (Madhya Pradesh), Mohali (Punjab) and the active pharmaceutical ingredient manufacturing facility in Toansa (Punjab) – are barred from the American market. “We are not looking at synergies of manufacturing; the focus is to achieve compliance first,” Shanghvi emphasised. However, analysts and industry observers maintained the manufacturing assets of Ranbaxy would be of huge benefit to Sun. With a record of good regulatory compliance, analysts and investors are expecting Sun to soon restore supplies from the troubled factories of Ranbaxy to gain market share in the US and other markets. Sun’s plant at Karkhadi in Gujarat was banned from shipping products to the US last month but has faced comparatively fewer regulatory actions in the past. Sun expects to realise revenue and operating synergies of $250 million by the third year after closing of the transaction. These are expected to result primarily from top line growth, efficient procurement and supply chain efficiencies. 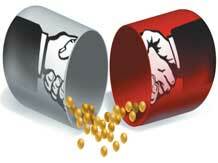 Ranbaxy has a significant presence in the Indian and the American pharmaceutical markets. The company also offers a broad portfolio of pending generic drug applications in the US, which includes some of the first-to-file opportunities. In high-growth emerging markets, Ranbaxy provides a strong platform which is highly complementary to Sun’s strengths. Citigroup and Evercore Partners are advising Sun Pharma, while Daiichi Sankyo is being advised by Goldman Sachs Group and ICICI Securities is the financial advisor to Ranbaxy for the deal. In recent years, Sun has acquired Taro, Caraco, DUSA and URL to strengthen its US sales. In this backdrop, analysts are positive on both the stocks. Ranbaxy’s large product basket pending approvals includes an exclusive generics launch of anti-hypertensive product Diovan (due in September 2012 with market size of $1.9 billion per annum for the patented product) and Valcyte product (due in September 2013; market size of $300 million). 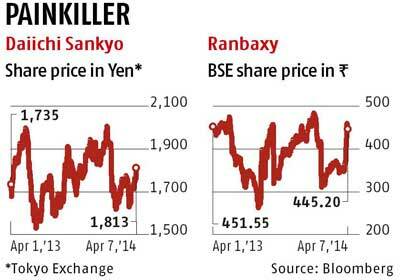 Analysts estimate these to contribute $120 million to Ranbaxy during the first six months of launch. Notably, in May 2014, the generic launch of acid reflux product Nexium (market size $5.9 billion per annum) is due, which could help Ranbaxy garner $300 million in sales. If Sun is able to get these product launches monetised, it will be a big boost for both companies. Nevertheless, Sun is likely to benefit more, feel analysts. Sun, whose FY13 consolidated sales stood at Rs 11,239 crore, is acquiring a larger company, one which clocked Rs 12,410 crore sales in CY12. But, Sun’s FY13 profits at Rs 3,469 crore were 3.6 times higher than Ranbaxy’s Rs 951 crore, largely due to higher PBIDT (profit before interest, depreciation and taxes) margins of 45 per cent versus Ranbaxy’s 17 per cent. Since Sun’s margins are significantly higher, there is scope for gains on this front. In the interim though, Sun’s consolidated margins and return ratios may take a hit due to Ranbaxy’s weaker performance. Analysts say knowing Shangvi’s record of successful acquisitions and their turnarounds, Sun’s promoter would have done good assessment of what he is buying and its potential. Also, most of the problems pertaining to Ranbaxy are now out in the open. Hence, any downside risk is largely known and priced in. Although Sun might take some time to turn around Ranbaxy’s fortunes, given its large size, there is no cash outflow and given Ranbaxy’s strong pipeline and reasonable deal valuations, these provide comfort. The all-stock transaction deal would lead to around 16 per cent equity dilution (worth $3.2 bn) for cash-rich Sun, besides debt of $800 million coming on to its books. The deal values Ranbaxy at 2.2 times the past 12 months’ sales. It puts the valuations at 1.6 times FY2015 estimated enterprise value/sales, at a discount to its peers which trade at 2.0-2.5x says Sarabjit Kaur Nangra at Angel Broking. Shareholders of Ranbaxy would get 0.8 shares of Sun for every share held, implying value of Rs 457 for each Ranbaxy share or a premium of 18 per cent to its 30-day volume. Hitesh Mahida at KR Choksey Shares and Securities feels if Sun is able to get the Ranbaxy pending product launches monetised, the significant part of debt coming to Sun’s books will be taken care. Analysts view the deal as EPS-accretive in the medium to long run. Looking at the overall gains, most analysts are positive on Sun. Sarabjit at Angel Broking maintains her ‘Buy’ recommendation on Sun, with a price target of Rs 661, while Ranjit Kapadia at Centrum Broking has a target price of Rs 780. Bank of America-Merrill Lynch, say: “While the deal will be earnings dilutive in the near term (minus four per cent in FY16), we see significant synergies over the next three to four years, which we believe will lead to 10-12 per cent incremental EPS in year-3 from the acquisition.” The research house has upgraded Sun to ‘Buy’ from ‘Neutral’ with a price target of Rs 680. For Ranbaxy, though, the stock might have corrected by three per cent to Rs 445 levels on Monday as a knee-jerk reaction to the deal. However, it is likely to start tracking Sun’s stock price and, hence, all corrections can be used to accumulate the stock, given the synergies and the positives emanating from the deal. With the acquisition, Sun Pharma will now emerge as the fifth largest global speciality generic pharma company following Teva, Sandoz, Actavis and Mylan. The CY2013 pro forma revenues of Sun and Ranbaxy combined stands at $4.2 bn. In India, Sun, along with Ranbaxy, will also emerge as the number one player with combined market share of 9.2 per cent, dislodging Abbott (6.5 per cent market share) from the number one spot. Sun has a market share of close to 5.4 per cent (last 12-month sales of $651 million) and Ranbaxy a market share of 3.8 per cent (LTM sales of $465 million). While Sun was at number one spot in seven specialities, the combined entity will become number one player in 13. Sun will also benefit from Ranbaxy’s presence in the rest of the world sales, looking at the latter’s strong presence in Romania, the rest of Europe and Africa.